WHILE the results are provisional at this stage, it is clear today that the people of Fiji have given coup leader Prime Minister Josaia Voreqe Bainimarama a democratic mandate. The provisional results from the Fijian Elections Centre at 6am when counting was suspending until later today. What do the results mean for Fiji? A clear majority of the population have embraced Prime Minister Voreqe Bainimarama’s vision and ideals for Fiji, rejecting discrimination and the “politics of the past” to give him and his party a democratic mandate after nearly eight years of military-led rule. Bainimarama’s restructuring of the psyche of Fijian society has been given the stamp of approval by Fiji’s voters. Now he will operate within the mechanisms of a parliamentary system that he and his right-hand man Attorney-General Aiyaz Sayed-Khaiyum have crafted for Fiji. The results show Fiji First way ahead of its main rival SODELPA, with a landslide towards Bainimarama. SODELPA leader Ro Teimumu Kepa will most likely be the leader of the opposition. “It’s a great day for Fiji,” said People’s Democratic Party president Lynda Tabuya earlier yesterday, after she cast her vote at the polling station at Tamavua Village Hall. “It’s been a long time coming,” said an emotional Tabuya, who is also contesting the elections. After visiting several polling stations in the Suva and Nasinu areas, Tabuya described the overall mood of polling day as one of seriousness – a stark difference from Fiji’s past general elections. She said it was more of a sombre mood, “like one of silent solidarity”. “Rather than one of lots of noise and lots of laughter, I think people are taking this day very seriously,” said the former University of the South Pacific law lecturer. 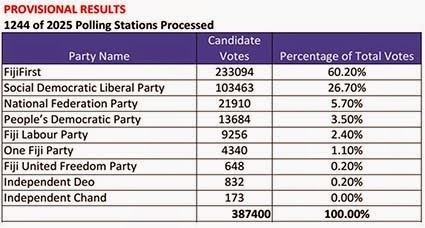 Fijians appear to have voted like an abused spouse in my opinion, a subjugated and politically out of practice population. At least post WWII brits got rid of Churchill for the rebuilding of their country phase. How can a major cause of Fiji’s problems for 8 years now be the solution?